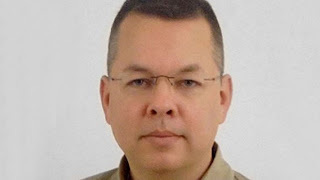 Pastor Andrew Brunson has wept in court following a Turkish court ruling to release him from prison, witnesses have reported. The court passed a three-year sentence on the 50-year-old preacher from North Carolina, who had been arrested and charged with terrorism offences, but said he wouldn't return to jail as he had already been detained since October 2016. Mr Brunson addressed the court before the judge's ruling, and said: "I am an innocent man. I love Jesus, I love Turkey." Stephen Carter is the regional director of Middle East Concern, a Christian charity that has followed the pastor's case closely. Reacting to the news of the expected release of Mr Brunson, Mr Carter told Premier: "It's wonderful news of course. It's still a breaking story. As far as I know, Andrew and his team are still in the court in fact. "This is all based on news that is filtering out from the court room. "Andrew should be free to leave the country - again we're waiting for confirmation of that and in particular, we're waiting to be able to speak to with Andrew and his lawyer and the rest of his team but that's certainly what it looks like at the moment." The pastor from North Carolina led a church in Turkey for 20 years before his arrest. He lived with his wife and three children while working for the small Izmir Resurrection Church. Mr Carter said the prayers of Premier's listeners and others around the world had helped "sustain" the pastor while imprisoned but he would still need prayers in order to rebuild his life with his family. "Do please continue to pray, clearly two years spent in a harsh prison environment - some of that under solitary confinement has paid a toll," Mr Carter said. "His physical health has suffered - although he seems to be in reasonably good condition now. "But do pray for physical healing, continued emotional and psychological healing and for that whole process of rebuilding life as a family back in the states - we assume."